“Even though our parents really wanted us to stay connected with our culture, we soon learned English within a month and kind of left our culture behind and tried to get absorbed in the American culture. But as we grew up, we both kind of regretted that,” said Kunthia Porter, 25, who with her sister Devin Porter, 27, was adopted in 1999 by the Porter family of Spokane, Washington. Kunthia describes herself, her sister and other campers as “Khmericans” — born in Cambodia, raised in America and shaped by both cultures because of their adoptive parents’ determination to educate them about their Khmer heritage. Each year, Cambodian Heritage Camp focused on a different theme, such as the Mekong River, with classes taught by Cambodian-American volunteers on the Khmer language, history, dance, music and, of course, food. Camp counselors, Cambodian-American college students and recent grads say they bonded with others who knew little of the language and ways of their homeland, but shared the experience of being the only child in their hometown who looked like they did. And this focus has resonated with families. “I wanted to find a pipeline back to my daughter’s culture, to make her aware of and proud of her heritage, and we wanted it incorporated into her view of herself and her self-esteem,” said Linda Ippolito, of Chapel Hill, North Carolina. Last summer was the last camp session. Because of Cambodia’s troubled experience with international adoptions, the U.S.-Cambodia adoption program has been suspended since 2001, which means there are no more families with camp-aged kids signing up to make the annual trek to Colorado’s high country. The families and counselors, tightly knit and connected year-round through social media and visits, are in the throes of planning the first reunion, with an eye on a longer-term goal of a group volunteer-project trip to Cambodia. “Nobody wanted camp to end,” said Kimsua Chay, 37, who first volunteered as a counselor in 2004. “It’s people you care about and have a good time with. Sharon Blender, one of the camp’s executive directors, said the Cambodian-American counselors also learned about their heritage at camp, including the traditions and rituals many of their families had brushed aside because of the trauma experienced in Cambodia. Chay, now a United Airlines pilot based in Los Angeles and the longtime counselor coordinator, is working on a mentorship program for 2018 summer’s reunion. He’s facing the same problem he’s had for years — an abundance of Cambodian-American applicants who want to pay their own way to Colorado to work for food and lodging at Snow Mountains Ranch in Granby, about a two-hour drive from Denver. The reunion is expected to draw parents even if their children have other commitments, something that happened during camp sessions. “It was a very confusing journey to adopt kids from Cambodia,” said Ippolito, noting her daughter Sophie was one of the last three Cambodian children granted a visa. 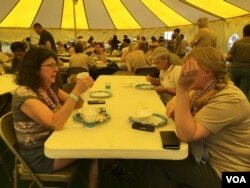 Camp afforded parents a chance to compare notes on their children, on their own experiences as adoptive parents and to attend workshops with experts. The Cambodian community in the United States is small, some 320,000 people or less than 0.02 percent of the total Asian-American population. Most are clustered in California, Massachusetts, Pennsylvania, Washington and Texas, according to a 2015 report by Center for American Progress. American families have adopted 2,355 Cambodian children, according to the U.S. Department of State. Many of the kids arrived with scant knowledge of their rich and ancient culture. Many Cambodian adoptees are living with their American families in areas where they are the only child with such personal history. Some live in places far beyond the comfort of immigrant communities. The Heritage Camps for Adoptive Families, the organization behind the Cambodian camp, also holds sessions for 10 other adoptee groups, including Chinese, Korean, Thai and Vietnamese. For families determined to understand their Khmer children’s heritage — Cambodia’s recent history of the secret American bombings, the Khmer Rouge genocide, during which between 1.7 million and 2.5 million people died, and civil wars — and their kids trying to connect to their roots, the annual summer camp provided more than the sum of its parts. 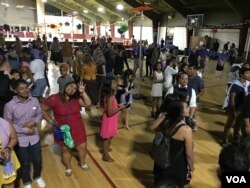 It took the gathered adult volunteers from the Cambodian-American communities and the camp counselors to introduce the adoptees to their birthright. Kimberly Lanegran, an associate professor of political science at Coe College in Cedar Rapids, Iowa, adopted two children, one of whom is Clair Mali Ottemoeller from Cambodia, a regular camp attendee. Chay said the effort American families made to bring their children to the camp inspired him.